The hurly-burly interactions in the compact group of galaxies known as Stephan's Quintet are shown in the upper left where a Chandra X-ray Observatory image (blue) is superimposed on a Digitized Sky Survey optical image (yellow). Shock-heated gas, visible only with an X-ray telescope, appears as a bright blue cloud oriented vertically in the middle of the image and has a temperature of about 6 million degrees Celsius. The heating is produced by the rapid motion of a spiral galaxy intruder located immediately to the right of the shock wave in the center of the image (galaxy labeled B in the wide field optical image on the lower right). Stephan's Quintet is an excellent example of the tumultuous dynamics of a compact group. The motion of the galaxies through the hot gas, and the gravitational pull of nearby galaxies are stripping cool gas from the galaxies, thereby depriving them of the raw material from which to form new stars. In a few billion years the spiral galaxies in Stephan's Quintet will likely be transformed into elliptical galaxies. 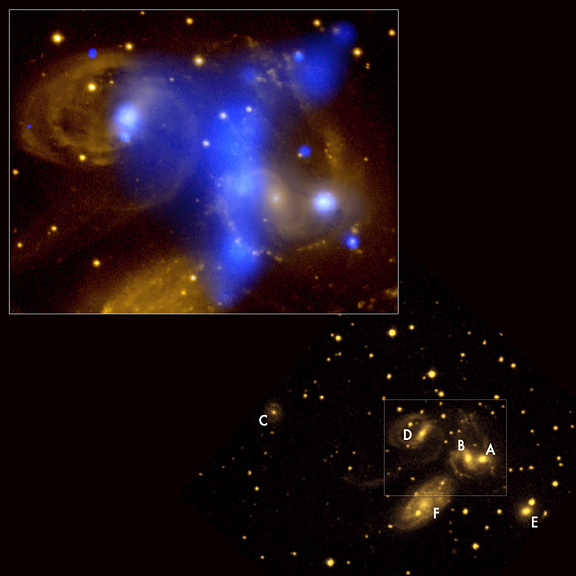 During the past few billion years additional gas may have been stripped from the galaxies in the group and heated by collisions such as the one seen in these images. An intruder that may have passed through the center of the group at least twice is the faint galaxy C seen in the wide field optical image. 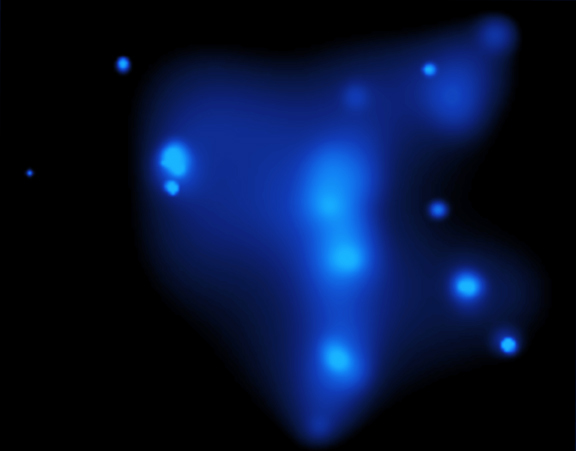 The fainter blue cloud in the X-ray/optical image may be a relic of past collisions. The four galaxies A, B, D and E strung out diagonally across the wide field optical image are at a distance of about 280 million light years from Earth. The large-appearing galaxy F in the lower left of this image has now been identified as a foreground galaxy at a distance of about 35 million light years, leaving the group originally identified as Stephan's Quintet with only a quartet of galaxies. However, if we include galaxy C, which is at the same distance as the other four galaxies, it becomes a quintet again! Ginevra Trinchieri of the INAF-Brera Observatory in Milan, Italy, Jack Sulentic of the University of Alabama in Tuscaloosa, and Dieter Brietschwerdt and Wolfgang Pietsch of the Max-Planck Institute for Extraterrestrial Physics in Garching, Germany are co-authors of a paper that describes the Chandra data on Stephan's Quintet. The paper will appear in an upcoming issue of the journal Astronomy & Astrophysics. Coordinates (J2000) RA 22h 36m 00.00s | Dec +33° 59’ 00.00"